I'm fascinated with the history of Phoenix. Not just the famous stuff in books, or a speech made by a politician, but everything. And although I do most of my history adventuring in cyberspace, sometimes I actually go out and travel around Phoenix. It can be a challenge for me, so I make sure to bring along a responsible party to do things like drive, etc. I've made some mistakes, and have talked to people who've done the right and wrong things, so I'd like to share some observations on how to have a successful history adventure. The first thing you need to do is to map it out. Just randomly driving around Phoenix is all well and good, but it's better to plan out something of a loop. You don't have to be stuck on the agenda, but it's nice to make a circle of your trip, not a zig-zag. I have found that about three or four places to go see is about right. I don't stay at these places very long, and I don't do guided tours, so I can be flexible about my time. I like start at 9:30-10 (after rush hour) and then be back while the sun is still shining. Seeing sights is best done by sunlight. I like to include at least one "then and now" scene, so I find a old photo, put it somewhere on my phone that's easy to find (I like to use the Message app), then I have it right there when I'm at the place. 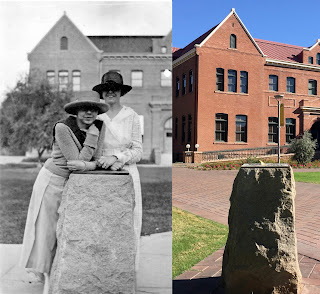 Yesterday I wanted to do a then and now on the ASU campus, and I had figured out as closely as possible where I needed to be. While I was eating a delicious cheeseburger at the Chuckbox I looked at the old photo again very carefully, and did my best to figure out where the original photographer was standing. Then I walked to that place and took several photos. I'm an old Graphic Designer and I know that it's wise to take a photo from farther back than too close because you can always crop, but you can't add to the edges if they aren't there. Of course taking photos isn't all that I do when I'm out history adventuring. I've known people who are so obsessed with taking photos that they're really just looking at their camera all of the time, and they miss a lot that they would see if they just put the darn thing in their pocket and looked around. I like to do that, I recommend it. The photo up there, which is a "then and now" on the Arizona State University campus (near Old Main on University east of College, in Tempe - 1915/2017), is an example of a fairly safe place to take a photo. Unfortunately, many historic places that you go to aren't quite as "upscale" as they used to be, so, uh, be careful, and be aware. People in neighborhoods may not understand why you're taking a photo of a particular house, which may belong to a friend of theirs, so don't take photos of houses without permission. And if you just want to park your car exactly where Father Kino walked, you may find yourself blocking a street, so try to stay in the 21st Century, at least enough not to be a nuisance. Speaking for myself, I find it helpful to bring a bag full of snacks (peanuts, etc.) and bottles of water. No, I'm not crossing the desert, but it's just nice to not have to stop just for a snack. Yes, I'll stop at the Chuckbox, and the Valley Ho, because that's part of the fun. But I'm really too impatient to stand in line at the Circle K for a bag of peanuts.